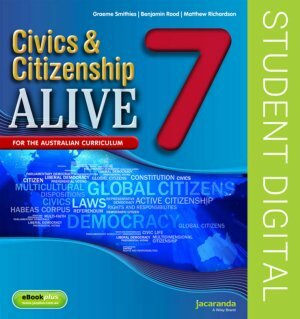 Civics and Citizenship Alive 7 Australian Curriculum Edition eBookPLUS (Online Purchase) is a comprehensive digital resource with completely new material created specifically for the Australian Curriculum. • Visual and engaging, packed with plenty of videos, photos and diagrams to explain concepts. • Accessible for students of all abilities and appealing to visual learners. • Digital resources include: video topic introductions, crosswords, multiple choice and true/false quizzes as well as eLessons and interactivities. • Key words highlighted with drop-down glossary definitions. Civics and Citizenship Alive 7 Australian Curriculum Edition eBookPLUS is available as a digital-only resource and provides access to all the course content. It also includes a wealth of multimedia resources accessed through our JacarandaPLUS website (http://www.jacplus.com.au/).